We live in an increasingly fast-paced world. Instant access. “Do you want to meet for dinner tonight,” I text to our son. Within seconds he responds and our plans are set. No more using the phone hanging on the kitchen wall like I did in the 70’s, listening to the ring on the other line and waiting for someone to pick up. No more calling back at intervals until I got a response. If I want to be entertained in the evening, I can sit down at 6:05, or 7:23, or 8:09, and have instant access to a wide variety of movies, 24-hour news, or my favorite television shows that I recorded. No more watching the clock and waiting until 7:00 on the dot, when my favorite show was aired on one of the three channels I received on my television through its antenna when I was young. If I’m hungry, I can call out for a pizza and get it delivered within a half an hour. Amazon is working on a drone delivery system from which we may be able to order and receive an item in a matter of hours, or perhaps even minutes. We’ve reduced waiting dramatically in our 21st century lives, and we become rather annoyed when waiting is required. New developments are continually being made in our technologies. We buy the latest and greatest cell phones, televisions to stream videos, cars with GPS. We are on a non-ending, ever-accelerating learning curve of selecting and using our devices. We are living by leaps and bounds. That is, until we are caring for a family member with Alzheimer’s. Then our fast-paced life grinds down to a crawl. Even from the early stages of Alzheimer’s, being with Dad, helping him, trying to accomplish something with him took not only longer, it took more patience. While he could still walk on his own, I used to take Dad to the grocery store. The act of just getting out of the car required a lot of time. Dad was moving slowly, and he wasn’t always paying attention to the agenda. It reminded me of when I tried to run errands with young children in car seats: getting them in and out of the car, navigating a store with them, prodding and corralling them each step of the way. While Dad was still fairly mobile, Mom wanted to get a stationary bike for him to use at home. She thought it might help keep his muscles strong and aid in maintaining his mobility. I took them to the sporting goods store where they had scooters for customers to use. As Mom and I talked to the salesperson and tried to make a purchase decision, Dad was all over that store on his scooter. I abandoned Mom with her decision and chased after Dad to prevent him from knocking over end-of-aisle displays, getting lost, or causing some other disaster. The time it took to accomplish everyday necessary actions ballooned. At first, while Dad was still able to take a shower alone, he would disappear into the bathroom and be gone for well over an hour. I have no idea what he was doing in there. Meals dragged on for over an hour, not just occasionally, but as a matter of course, as we sat watching Dad push food around on his plate, encouraging him to take a bite of food long after we’d finished our own. With Dad, we weren’t living by leaps and bounds anymore. We were living inch-by-inch. Then later, as Dad became less and less able to function, we were living dot-by-dot until it seemed as if time might stop altogether. It takes a lot of patience on the part of the caregiver, and quite possibly on the part of the loved one with Alzheimer’s as well, to live inch-by-inch. I showed up about once a week to help out with Dad. Mom balked if I tried to come more frequently. “You have your own family and your own life to live,” she said. So I came once a week with an extra day thrown in here or there for doctors’ appointments or other special needs. It was easy for me to have patience helping Dad. I was a short-timer. I was there solely to help with Dad. If it took us an entire afternoon to run one errand, so be it. Later, when Dad could no longer feed himself, if it took over an hour to feed him his meal, that was okay. I wasn’t there morning, noon, and night, day after day, week after week, for all the getting up in the mornings and going to bed at nights, the trips to the bathroom, the breakfasts, lunches, and dinners. My mom was. And it took a lot of patience. Maybe more at times than Mom was readily able to muster. At first Mom managed alone, with occasional help from one of my sisters or me. Then we talked her into getting a home health aide in the morning three days a week. We upped that to seven days a week. Then we added a home health aide in the evenings to help get Dad in bed at night. It was a two-person job. The basic necessities of life expanded to fill my mother’s days. Mom’s life was reduced to inches. Inch-by-inch, Mom got Dad out of bed and into the bathroom after his afternoon naps, helping steady him as he struggled his walker through the hall, one painfully slow step at a time interrupted by complete halts. Inch-by-inch Mom helped Dad navigate getting the food from his plate to his mouth, then chewed and swallowed. I know this is a bleak picture. Those trying to maintain a quality of life for their loved one with Alzheimer’s may be leading a bleak life. Some of them are living an inch-by-inch life. They need our help. This entry was posted in Alzheimer's and tagged Alzheimer's, Care-givers on February 26, 2016 by CMSmith. Critique: Deftly presented with candor and grace, “Where Memories Meet: Reclaiming My Father After Alzheimer’s” is a poignant and personal story that is an informative and absorbing read from beginning to end. 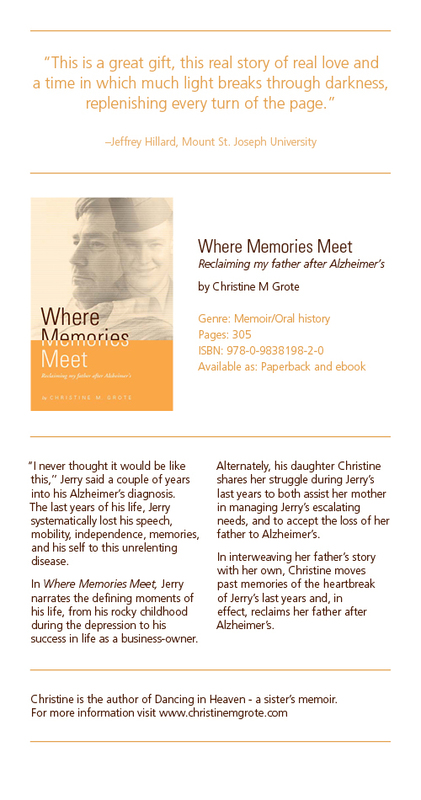 Especially recommended for anyone having to struggle with the medical condition Alzheimer’s for themselves or a loved one, “Where Memories Meet” will prove to be an enduringly valued addition to both community and academic library collections. 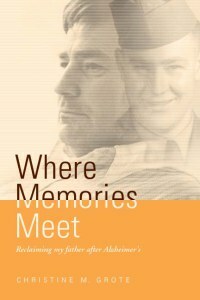 For personal reading lists it should be noted that “Where Memories Meet” is also available in a Kindle edition ($2.99). On their website, Midwest Book Review also has posted a long list of other reviewers. If you are an author in need of book reviews, you might find this an excellent resource. This entry was posted in Books, Where Memories Meet and tagged Alzheimer's, Books, Reviews, Self-publishing, Where Memories Meet on February 22, 2016 by CMSmith. Today marks three years since my father’s last birthday, his 80th. Where Memories Meet is two stories in one book. It is my memoir of losing my father to Alzheimer’s, and Dad’s account of the defining moments of his life. My story begins at the end of Dad’s life and proceeds backwards in time. Dad’s narration begins with his birth and moves forward in time. Eventually the timelines, or the memories meet. I came in on the 18th day of January 1933, at 715 Manier Avenue, Piqua, Ohio. My Aunt Agnes said that my dad’s mother, my Grandmother Smith, insisted on naming me Jeremiah after my Grandfather Smith. Agnes claimed my Grandmother Wirrig was angry about that. And I might have been named after Jeremiah, but the name on my birth certificate is Jerry Allen Smith. Not Jeremiah. When my dad was young his father, my Grandfather Smith, was mean to him. My dad was always in trouble and not very controllable. He was in a mental hospital around the age of 17. My mother never knew about that until much later. My Aunt Agnes said my mother and my father met at a funeral. The first I know about my parents was when they were on top of the Hazell Maria apartments on North Wayne. They had dancing up there. My dad always was a dandy. He liked to dress up. He was a pretty good-looking guy when he was young, and he was quite a good dancer. My mother liked to go to dances on the rooftop. I don’t know if they had a live band, or radio, or what provided the music up there. I didn’t come along until a little bit after that. My mother was living with her folks on Manier Avenue. They were a devout German Catholic family. And my dad was living with his folks, a devout Irish Catholic family, on Cottage Avenue. In those days the Irish and the German Catholics did not see eye-to-eye. So there was a bit of family discord from the beginning. My dad wasn’t going to marry my mom, but her father, my Granddad Wirrig, went over and made him, I was told. My granddad, he wasn’t happy about it at all. There was a big fight over there. I caused a lot of trouble. Lots of trouble. I’m the product of all of that. My parents got married in September of 1932, and I was born five months later in January. I have no idea if a midwife helped my mother. I was present, but I don’t have a recollection. Uncle Paul said it got a little exciting around the house. When I was at the age where the likelihood of that happening to me was a real possibility, my Grandmother Smith told me that I shouldn’t be messing with girls. She told me that’s where a guy could get in a lot of trouble—messing with a female. I didn’t know anything about it when I was just a kid. I had one guy on my paper route call me Shotgun Smith because he knew that my dad had to get married, and he knew whose fault that was. I didn’t know what the hell they were talking about when they called me that. I don’t remember how I found out about that. Things happen. You don’t get a time stamped or nothing, you know. Mom was buried the day after her funeral Mass, on the morning of Dad’s 80th birthday. We didn’t take Dad with us to the cemetery. It was too long of a drive back to Piqua, and it was too cold. But we plan to celebrate his birthday this afternoon. Dad likely wouldn’t have known it was his birthday today, except for the birthday bulletin board in the hall and reminders from the Walnut Creek staff. Dates have been a problem for Dad since the very beginning of this. Even though we are emotionally exhausted, we decide to celebrate his birthday in the afternoon when we return from the cemetery. It all works out for the best. Dad’s adult grandchildren are still in town from the funeral, so we have a pretty good group to celebrate his birthday. We bring a bowl of vanilla pudding for the birthday candles, instead of cake. Dad’s sister, my Aunt Marilyn, is with him in his room when we arrive. Dad is reclining in his bed. Aunt Marilyn is excited. “Your dad can read, Happy Birthday,” she says. “He’s said it two or three times.” She holds a small balloon with the words printed on it. “What does this say, Jerry?” she asks. After a brief pause, haltingly, his voice barely above a whisper, and his words shaky and creaky, my father says, “Happy birthday.” It is the last time I will ever hear his voice. This entry was posted in Books, Where Memories Meet and tagged Alzheimer's, Books, Excerpts, Photos, Where Memories Meet on January 18, 2016 by CMSmith. These are just a few of the questions I answer in Kathleen Pooler’s interview. Kathy is the author of Ever Faithful to His Lead: My Journey Away From Emotional Abuse (that I reviewed here). She posted another insightful interview on her blog at Memoir Writer’s Journey. Kathy’s doing good work over there. Of course, the interview was with me, so I might be a bit partial. Or not. You decide. Read it here and leave a comment to enter to win a free signed print copy. And when you’re finished over there, I hope you’ll visit Cynthia Robertson’s blog where she reviews and is running a GIVEAWAY of a signed print copy of Where Memories Meet. Enter by leaving a comment here. “Grote has a talent for spot-lighting the sort of intimate and telling details which ring an answering note of emotional recognition in her readers,” Cynthia writes. Again, another talented and insightful writer, in my impartial opinion. Kathy Pooler’s Interview and giveaway can be read here. Cynthia Robertson’s review with giveaway can be read here. This entry was posted in Books, Self-publishing, Where Memories Meet and tagged Alzheimer's, Books, Giveaway, Interviews, Kathy Pooler, Memoir, Where Memories Meet on December 14, 2015 by CMSmith. My introductory price of $2.99 for an ebook will stay in effect through December. Afterwards, I will likely return the price to $3.99, where I started in September. If you have purchased, read, and liked Where Memories Meet – Reclaiming my father after Alzheimer’s, I hope you will write a short review at Amazon and copy it to Goodreads. It really does help me. If you have purchased, read, and not liked my book, I hope you will leave me a comment here so I can learn and respond. If you have a book club and would like me to answer questions, in person if local to Cincinnati or via Skype if not, please contact me. If you have a blog and would like me to write a guest post about my books, or writing process, please contact me. This entry was posted in Books, Self-publishing and tagged Alzheimer's, Books, Promotions, Where Memories Meet on November 9, 2015 by CMSmith. I wanted to share the postcard my daughter designed for me to help me inform people about Where Memories Meet and ask for reviews. I have to thank Trace Conger for the idea. He writes crime thrillers and is the author of The Shadow Broker, the first book in a series about a great character named Mr. Finn. I don’t read a lot of this genre, but I really enjoyed this story. I contacted an Amazon Top Reviewer who had reviewed another book about Alzheimer’s to ask her if she would review Where Memories Meet. I told her a little bit about the book, added the postcard, and then said that if she didn’t want to read another story about Alzheimer’s, perhaps she would consider reviewing Dancing in Heaven. I got a response back from her pretty quickly and I thought, uh oh, she probably isn’t interested in either book. I was wrong. She asked to read BOTH books! I don’t use a lot of exclamation points, but that’s how I felt when I saw her response. This publishing experience has helped to rekindle and strengthen my belief in the goodness of humankind, and in particular individuals. The excerpts from the review I’m going to share with you right now, however, came from someone else altogether. The part I italicized makes me cry. I think it’s because, oh my gosh, she got it. This is tough emotional business. Here is a short excerpt. The entire review is posted on Amazon’s Where Memories Meet page. “It is Christine Grote’s ability to depict, with honesty and dignity, the struggles and the humanity behind the disease that most hit home for me. “The book is well written and it was an honor to understand Jerry as the man he was and the man Alzheimer’s affected. This entry was posted in Books, Self-publishing, Where Memories Meet and tagged Alzheimer's, Books, Reviews, Where Memories Meet on October 6, 2015 by CMSmith.